Caption slip reads: "Photographer: Brett. Date: 1955-07-16. Reporter: Swaim. Assignment: Foothill freeway. 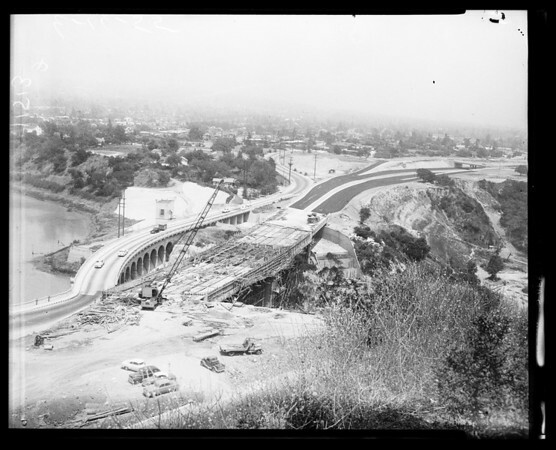 K19, 20: Looking east across old and new Devil's Gate bridges, showing east approaches to new freeway. (without filter). K3,4: Same, with red filter. K21,22: Looking northwest from same spot toward La Canada, showing Flintridge approaches to bridge already in use. Muddy water is lake behind Devil's Gate dam. K23,24: Same, with red filter. K9,6: Straight overhead shots of deck of new bridge, with workmen preparing forms. Pix made from bucket swung on crane. K5: Looking up Devil's Gate gorge toward new structure."